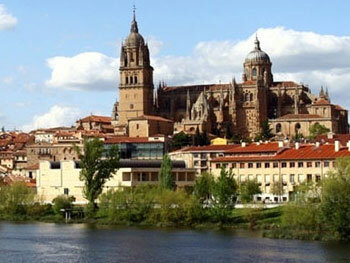 The golden-hued city of Salamanca sits in Spain’s north-western corner, in the autonomous community of Castile y León. Beautiful architecture, including two striking cathedrals and the famous Casa de las Conchas (House of Shells), line the narrow, winding streets of the old town, which in 1988 was declared a UNESCO World Heritage Site. One of the most important seats of Spanish learning, Salamanca is the perfect choice of location for your Spanish course. Home to the oldest university in Spain (and one of the oldest in Europe), Salamanca, although a relatively small city, has a large student population. 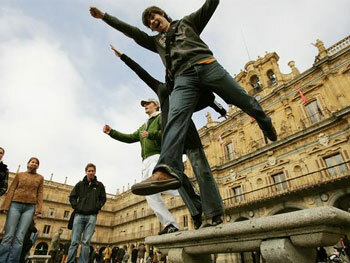 This means that, as well as being a historic city, Salamanca also has a very youthful atmosphere. 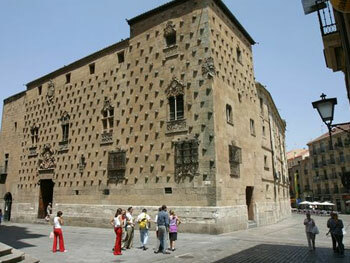 It also means that Salamanca has been home to many of Spain’s most prolific poets, authors and philosophers. Salamanca is always a very popular choice amongst students learning Spanish, as it is reputed that Salamantinos speak Spanish with the ‘purest’ accent. Of course, it is from this region that ‘Castilian’ originates and most foreigners do tend to find the accent here very easy to understand. Due to the popularity of this location amongst our students, we actually have two schools here. There is nothing to separate them in terms of professionalism or quality of teaching, although they do offer slightly different course and accommodation options. Please read on for further information about our Salamanca school, or view our page on our Salamanca (Premium) school. Our school in Salamanca is ideally located in the city centre, less than 5 minutes’ walk from both the old town and Plaza Mayor, the city’s focal point. In a pedestrianised zone, the school is housed in a four-storey building which offers excellent facilties for students, including 32 classrooms (20 of which have interactive whiteboards), language laboratories, computer rooms (and WiFi throughout), meeting rooms, assembly hall, student common rooms, a library and even a gym! The school building has both central heating and air-conditioning, ensuring that you will be comfortable whatever the season. 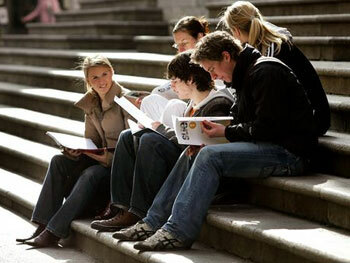 There is an exceptional range of Spanish course options available at our school in Salamanca. The most popular option is the ‘Intensive’ course of 20 group lessons per week. This course is a fantastic option if you are looking to improve your overall level of Spanish whilst also having plenty of time to explore the city and testing out your Spanish skills on the locals! This course option will mean that you have 4 lessons per day from Monday to Friday. Alternatively, if you want to progress just that little bit quicker, you may like to consider the ‘Super-Intensive’ course of 25 lessons per week, or the ‘Mini-Group’ course of 20 lessons per week in groups of no more than 6 students (the maximum class size for all other courses is 12 students). We also offer ‘Exam Preparation’ courses for the DELE exams and an ‘A-level Revision’ course which is suitable for students preparing for the A-level, International Baccalaureate or Irish Leaving Certificate exams. You can even choose to add the ‘Business’ course to some group lessons to prepare yourself for the Chamber of Commerce exams (CAMA). We even offer courses for non-native teachers of Spanish! Our ‘Spanish for Teachers’ course will not only improve fluency but also covers the methodology and practicalities of teaching Spanish as a foreign language. Finally, we also offer an ‘Academic Year’ course, which is a 40 week course designed for students who wish to reach a very high level of Spanish and be able to communicate easily in all aspects of daily life. Most students start this course on the first Monday in September and finish in mid-June, after taking a 2 week break over the Christmas period. For the first 23 weeks students will have 25 lessons per week. The following 12 weeks will consist of 20 lessons per week focusing on preparation for the DELE exam (the exam itself is optional and the fee is not included in the course price). For the final two weeks students will have 10 lessons per week, when they will focus on preparing for the Chamber of Commerce exam (again, the exam itself is optional and, therefore, the exam fee is not included in the course price). All accommodation is centrally located and should be no more than 15 minutes’ walk from the school. Generally, the accommodation will be available to you from 14.00 on the Sunday before the course starts until 22.00 on the Saturday after the course finishes (extra nights may be available upon request). 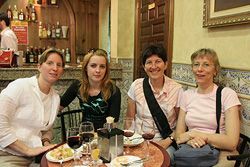 To achieve full immersion in the Spanish language, as well as the culture, we would recommend host family accommodation. This will allow you to speak in Spanish with native speakers on an everyday basis and you will be surprised at the amount of vocabulary that you pick up, as well as the confidence that regular speaking practice should give you! This accommodation option is offered on a half or full board basis. We do realise that staying with a host family is not everyone’s preference and, therefore, we do also have other accommodation options available. If you do wish to stay on a half or full board basis with other students rather than with a host family, you may like to consider staying in student residence accommodation. In Salamanca, this is university halls of residence and so, whilst it is comfortable, it is also fairly basic and is generally recommended for students in their twenties. During the academic year, most of the residents will be Spanish, whereas in the summer months it is likely to be almost exclusively international students staying here. You will have your own room and will share the other facilities (i.e. bathrooms and communal areas) with the other residents. If you would prefer to self-cater and stay with other international students, you may like to consider shared apartment accommodation. Again, this accommodation type is generally comfortable but basic and, therefore, is most popular amongst students in their twenties. You will have your own room (unless you choose to share with another student) and will share the other facilities (i.e. kitchen, bathroom and general living area) with your flatmates. Finally, if you would like to stay more independently, we can also arrange studio apartment accommodation. Our school in Salamanca offers regular activities, to help you to make the most of your time in the city! From guided tours of the city to dance, cookery or even Spanish guitar lessons, the range of activities offered means that there is sure to be something to interest you. All activities are completely optional and may incur a small additional charge payable directly to the school (to cover costs such as transport and entrance fees). Please note that, as is the case at any of our schools, there is usually a minimum number of participants required to run the activities. Most students fly into Madrid Airport, although it is also possible to fly into Valladolid. From either of these airports you can take a train or bus to Salamanca. Average score for our school in Salamanca based on 75 previous client reviews. The course was naturally very good, as was the 'setting' achieved by the pre-arrival test. I had the added bonus of the A-Level revision section which was useful, but maybe perhaps lacked in covering all the areas available on my course (that said, with new A-Levels coming in its rather harsh to judge this). My family were lovely, and they offered me a pleasant room in their flat. It was a 15 minute or so walk to the school, which was often quite a lot longer than other students. However the amble was all rather beautiful so I shouldn't complain. I was cooked some lovely food whilst there. The course was well run and I was placed - appropriately. - in the lowest group as I was a beginner to learning Spanish. The grammar part in the first session was possibly the weakest link as it felt as though it was dominated by irregular verbs, but the conversation in the second part was excellent. I followed a 4 week superintensive course then a 10 week DELE preparation course, both of which I was very satisfied with. The standard of the teaching was high and my Spanish has improved enormously. I was extremely pleased with the teaching, I now speak Spanish almost fluently and will definitely be coming back in the future. The school in Salamanca was amazing. The building very modern and well equiped. Very well organised in both the aspect of teaching and activities. The director gave 100% to his job, he made sure every student was happy etc... There really was a sense of community spirit within the school. I have attended language courses in France and Germany and they have never been as excellent as Salamanca. My host mother, Julia, was an absolute darling, extremley friendly. She made a genuine effort to sit at the table at lunchtime to chat to her students. Cooking not great but not everything can be perfect. Appartment clean etc.. Location excellent less than 5mins walk to school. Brilliant course, helped a lot speaking in spanish all the time. Good teachers, although would have been good to have more teachers. Will definately be returning next year. Brilliant accommodation, very clean, lovely woman, very welcoming and nice thoroughly enjoyed staying with her. Good distance from the school and centre of town. Would love to stay with the same lady next year. I thought that the course was very helpful and good for my spanish. Unfortunately my friend and I were only in Salamanca for 1 week however we plan to go back next summer for longer. The teachers were good (especially Maria who taught grammar) and always nice. We stayed with Genoveva Martin Garcia and she was so lovely. She was kind, helpful and very welcoming! If/when we return we would like to be placed with her again as we had such a nice stay with her this summer. I recommend her! I thought that the school was well organised and I was surprised that there was so much on offer such as cinema trips, tapas tours, trips to other cities, We had a really good time there. Very helpful with the grammar, and conversation lessons were interesting and enjoyable to do as they were quite informal. Lessons were quite long, maybe could be a little shorter as concentration was difficult to hold for an hour and a half. Very good way of meeting friends, lots of fun and an experience i shall never forget. Good mixture of grammar work and conversation. I liked the fact that it was all conducted in the native language. I also liked the extra activities arranged. Brilliant, I was never strong at languages and although I still dont call myself strong at spanish in anyway I have been given the confidence in conversation to give it a go. The teachers were great and full of enthusiasm. Language school is great to do just for a few months in a year out, you make so many good international friends and the night life was amazing where I was which helped. Generally very good, the teachers were all extremely friendly and helpful. I stayed with an elderly couple who took very well care of me, from providing me with food even when I went away to other cities all day (they prepared a packed lunch) - and vegetarian food at that - to answering my questions about local places and ensuring the room was comfortable and clean. Their generosity was obvious as they made me feel like part of their family even though I was only staying there for 2 weeks. It was excellent! Thoroughly enjoyed all of the course in Salamanca, everybody was extremly friendly and welcoming. The student residence in Salamanca was excellent. Full-board is a more popular option that half board. The teachers are enthusiastic, motivated and have an acute sense of exactly what each individiual is looking to get out of the course. The course was good, the teachers have lots of patience and are friendly and helpful. Salamanca is such an easy city to get around and its friendly too. The family was very good, food was good and plentiful, the Spanish mother was very nice too. I learnt a lot, but i also had a lot of time to discover the city or meet other people, the school also have such a lot of activities - you will never be bored. I lived in a shared flat and it was so nice to live with other students from other countries, I really discovered a lot about other cultures and others way of life. I really think to go to a country to learn a language, it's the better way to learn. Its also such a nice experience, you grow up a lot, you learn a lot about yourself and you open your mind! Very useful and I learnt a lot. The school provided excellent facilities and resources, and were available to help at most times. The teaching was excellent and the extra activities provided were varied and interesting. Cannot be faulted. Brilliant- very clean and tidy, the family were lovely and could not do enough for me. The other students were friendly and welcoming and the food was impecable. I was very happy to live there for two weeks and sad to leave. I very much enjoyed my trip and course in Salamanca, it haas given me a lot of confidence and I cant wait to do something similar in the future. I thought it was extremely beneficial and the lessons were well constructed. I enjoyed the lessons a lot and would love to do a similar course in the future. The accommodation was brilliant. It was a clean, friendly environment with fantastic cooking! I would highly recommend it to anyone, and I would return there without any hesitation. The extra-curricular activities provided by the school were very good, such as the various films they showed, free of charge. This was great. I was amazed at how different the teaching was from England - it was absolutely great! The teachers were extremely friendly and very patient in the lessons, making every lesson as fun as possible with an informal attitude to teaching. I met so many incredible people in Salamanca, i miss it so much! The school was very welcoming and organised many activities which you could take part in such as the tapas tour, salsa classes or even art lectures. The city itself was beautiful and buzzing with people without being overcrowded. Overall it was an fantastic experience which I'd recommend to anyone and which i hope to do again in the future. The accommodation itself was nice and there were other students living with me too. it was great fun as i was able to make friends even before starting the course and improved my Spanish a lot too. i would definitely recommend staying with a family as they give you a lot of independence and you can quickly make friends and improve your Spanish to an extent that you wouldn't in a student flat. I thought that it was really good and I really enjoyed it. The teachers were lovely and i liked how the lessons were split into two, conversation and grammar. It was a brilliant re-cap of bits of my spanish that had become rusty and really made me understand the spanish language in greater depth. The tutors were friendly and accommodating to our needs. Our accommodation was good, the host family were amazing and the food was fantastic. It was the perfect location and the trip could'nt have been better because of it. My course was brilliant and an amazing opportunity to improve my Spanish. The teaching was very good and helpful from people who mostly only spoke spanish! The staff were all really friendly and the location of the school was perfect. My accomodation was amazing! The family I stayed with were very welcoming, friendly, relaxed and experienced in having a foreign student as a guest. The food was fantastic as was the location and I loved the fact that there were other students from my course with familys near me. I really enjoyed my course. It was intensive but each day the class was taught by three different teachers with an emphasis on a different aspect of language learning which prevented it from becoming boring. The teachers were approachable and friendly and covered a lot in a short space of time whilst constantly checking that everybody understood concepts before moving on. My accommodation was great and I would strongly recommend a student residence to anybody thinking of studying in Salamanca. The residence was very central making it the safest option for returning home in the evenings. The flat was cleaned every day and the residence owners were friendly and very patient with me as my spanish was very basic upon arrival. The room was well furnished with a huge wardrobe, 2 sets of shelves and a desk and it had a great view over the city. The bathroom was also only shared between two people which was great. Very pleased over all with school. Particularly impressed with amount of extra activities on offer including History and History of Art lectures and film viewings which were all at no extra cost. Teaching standards extremely high. Very pleasant and interesting family who were well used to and seemed to thoroughly enjoy welcoming foreign students into their home. There were several other students of various nationalities so it ended up being a real 'Auberge Espagnole'! I am aware that not all experiences of living with host families are as positive. My own room was within separate flat within the family's own flat which meant I had the best of both worlds ; the support and security of a family and meal times with them but my own personal space and separate entrance so I was able to come and go as I pleased. Enjoyed the course. Great teachers, good fun. I stayed with a lovely lady, very nice food. I really enjoyed the whole language course, it really does help to improve your language in vast amounts. Our accomodation was great, the rooms were good and the food was excellent. The family was very friendly and I would be happy to stay there again. I really enjoyed the course and being mixed with people we hadn't met before was nice. The teachers were really friendly and the additional activities on offer were helpful to fill the time. I loved staying with Maria Jose and Juan. They were really friendly and welcoming and I liked the fact that there were a lot of people there. They encouraged us to talk more, and I felt very at home there. The meals were lovely and the bedroom and bathroom were absolutely fine. I liked it how Maria Jose didn't actualy speak English so you had no choice but to speak Spanish around her. I thought the teaching was very good and the assessment of level seemed spot on. I liked having a very structured gammar lesson and then more conversation. I only registered for the 20 hours and another time I think I would do the 25 as other students said the 3rd lesson they had was very good and taught them more about Spanish culture as well as language. I also very much liked having the opportunity to watch films and have lectures in Spanish too. The course was excellent. Made especially so by the teachers who were very capable and able to integrate all levels of Spanish within their classes. I am looking forward to continuing my studies with them. The school was clean, well kept and very welcoming -all the teachers were fantastic and the lessons were effective and enjoyable! I would thoroughly recommend Salamanca as a city and Mester as a school for both beginners and experienced speakers alike! The family I stayed with was lovely, the accommodation was clean, the food was delicious and we plan to keep in contact! The overall experience was very positive and I would highly recommend it. The course consisted of two hours of Spanish grammer followed by two hours of conversation. Within that time there were two breaks of 15 minutes. The teaching was at a very high level of competence. My own two teachers could not have been better. Very very helpful, well educated, very professional and fun. I lived with a family who were very kind and helpful. The woman of the house had the patience to listen and correct my Spanish. I found I suffered a culture shock. My room was adequate, the room was a bit small and the bed more suited to young students. The flat is very conveniently placed across the road from the school. The course was really good. There were excellent resources and the staff were enthusiastic and helpful. All classrooms had interactive whiteboards and access to the web. Lessons were interesting and encouraged students to debate and use grammar in conversation. I feel much more confident about my speaking and my level of competence generally. I really enjoyed the course and was surprised how much I was able to learn in only 3 months. The teaching was of a very high standard and all the staff were incredible friendly. I found that working towards an exam every 4 weeks was beneficial and I would have even been happy to sit an exam every 2 weeks. My host family were very accommodating and friendly and I couldn't have wished for anything more in terms of the family. The only downsides to my accommodation were the lack of wifi and the location which was not as central as I hoped it might be. The positives of living with a family far outweighed the negatives though. I believe my Spanish improved much more quickly because I was living with a host family too. I would definitely recommend doing a long-term language course in Salamanca as it's a great way to make friends and learn a new language. Excellent teaching and resources. Lively, stimulating lessons with interesting tours and talks. Comfortable, modern, clean and high standard accommodation, friendly, kind and hospitable host. The course was very good. I found the formal grammar sessions very thorough and helpful. The structured conversation sessions were also challenging and supportive. My studio apartment was very comfortable and as a mature person it suited me to be independent. I liked being able to cook for myself and to watch television in the evenings. My course was absolutely brilliant, I learned so much and my level of Spanish definitely improved. Couldn't have asked for better accommodation, It was clean and tidy with tasty Spanish food and about a two minute walk from the school. The course was excellent - just what I wanted - intensive. The course books were very very useful with lots of exercises for practise. The staff at the school are very helpful and approachable. The facility was good, computer use was free. I must applaud all the teachers especially the teacher who taught us Spanish Grammar. She was patient and her teaching method was excellent. The lessons were very fast paced which was good so I learned a lot in the three weeks I was there. I have enjoyed my course and my stay. The course was well delivered, fun and educational. There was a really good mix of nationalities and different cultures in the class making for a great six weeks in Spain. I was fortunate enough to have really nice accommodation with some fantastic flat mates. It was very central, within minutes walking distance from the school and ideal for just about everything. I would just like to thank Language Courses Abroad once again for a fantastic time and good choice of school and accommodation. I will be sure to go again some time in the future. I liked the class size and the teachers. I loved the accomodation and the family were lovely, I don't think I could have asked for a better experience. It was brilliant! The course was really well organised and the teachers were brilliant. They taught in a fun way, but I also learnt loads of new things in just two weeks. I could not have hoped for anything better. My accommodation was clean and the food provided was brilliant. The family were also welcoming and helped with any problems I had. I thought the school was excellent. All the teachers were very helpful. I enjoyed the grammar classes with the lively teacher. Our conversation classes gave us the opportunity to meet people from all over the world. It was a really good experience. We stayed with a Spanish family. There were other students living in the same house. Two were from Holland and one was from Germany. I got really friendly with the other students. The family was lovely and it really helped me develop fluency in my spoken spanish. I got used to hearing them speak fast and by the end of the stay I could understand a lot of spanish. I enjoyed my classes, especially the conversation sessions. Very clean, room regularly tidied, central location. Really impressed! Thanks for a great time: I made so many new friends and would recommend Salamanca to anybody wishing to learn Spanish, be they beginner or advanced. The balance between socialising and learning couldn't have been better, and I'll never forget the fortnight I spent in this beautiful city... see you next summer! I chose the individual study option, as I wanted to focus on some specific areas. The tutors certainly did a good job in covering the areas that I had asked for, but covered a lot more besides. The standard of teaching was very high. The accomodation was of a high standard, and the meals were delicious, everything was home made, and the family were very kind towards me - I'm sure that what I received was beyond what was expected from a host family. There were plenty of opportunities to practise the language at the appartment as well. In the school I used the 'tu/vosotros' forms to speak to the tutors and other students, but the 'usted/ustedes' form at the house as the host family were a retired couple. This was a good experience, as it allowed me to familiarise myself with both types. I felt that the school had an excellent programme of activities in addition to the language classes, such as cultural conferences, and evening activities such as tapas crawls and language exchanges (intercambios). Any activities that had a cost were very reasonable. I also felt that the staff at the school genuinely cared for the students and attended well to any concerns or welfare issues. Other students from were also great fun to be in their company, and made me, as an individual traveller, feel part of a group.